Today's blog post comes with a background story. One day years ago, someone planned a surprise birthday for their friend Ami, who at that time was not yet a part of our 32-human-strong volunteer team. 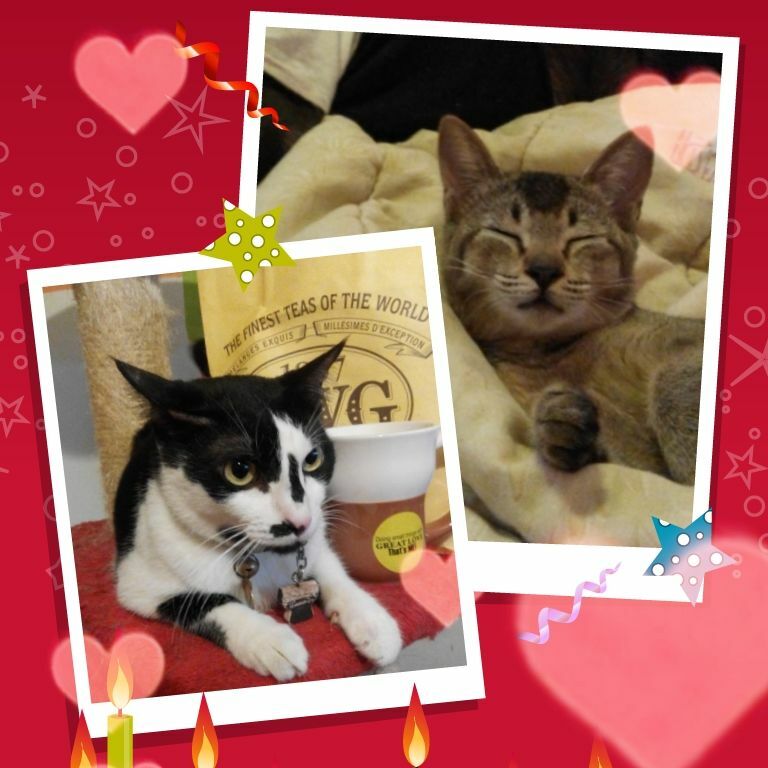 Her friend asked us this: Could we allow them the use of our foster home for a birthday party? Ami -really- loves cats. So we said yes and the party happened smoothly. Ami didn't guess where her friends were taking her to for her birthday surprise until they said, "We are going to Ubi." Ami had a purrfectly wonderful evening, we are happy to report. Hence, now that she is one of our committee members, she proposed giving everyone else who loves cats the chance to have a special lounge-around cafe style at our foster space. Yes, Ami is also a mad cat evangelist! Share the love! So we present to you, starting this March, available for all of you: a rustic cat cafe-like experience. Our foster space is located in Elaine and Andy's own home, so it is very laid back in its ambience. (It is... beyond hipster. We actually do have bicycles in our lounge, Which are actually used.) Andy and Elaine will brew coffee and tea for you to enjoy with your dinner, using freshly roasted beans or loose leaf teas, and you will have a vegan meal catered by The Garden Slug. Kitties that are allowed to roam outside their cat suites will hang around in the foster space with you while you dine. Feel free to get distracted by them! Wanna sign up? Read on! 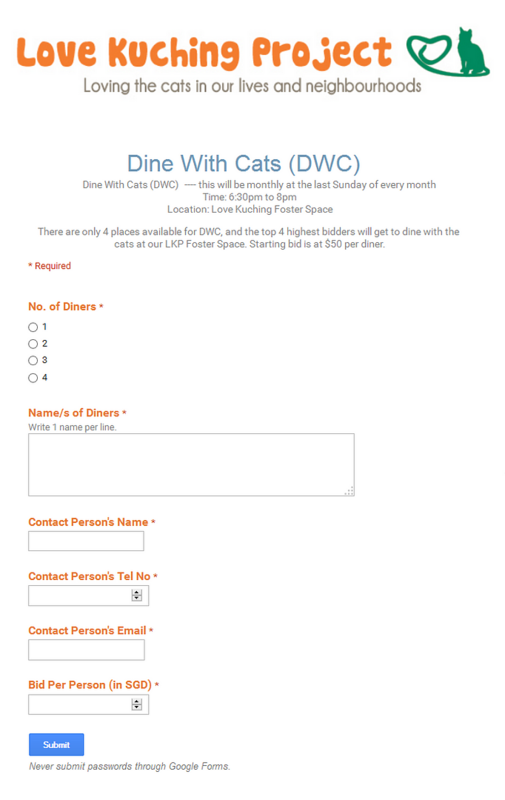 Because we are a nonprofit corporation, DWC is not going to be operated based on cat cafe charges, but by freewill donations starting at $50 per diner via a silent auction. You have to bid $50 or higher per person, in order to stand a chance to be one of our 4 guests per month for DWC. We only have 4 places available for reservations each month due to space constraints. The highest 4 bidders will be awarded the reservations for DWC, hence the higher the bid, the more likely you will get the reservation. The winners of the DWC silent auction will be announced on the second Thursday of the month, and will be contacted by our volunteers after announcement, to confirm the reservation and to tell you The Garden Slug specials that will be your main course. The menu catered by The Garden Slug is vegan to suit all dietary needs, and will not contain onions because they are toxic to cats should they accidentally eat a food scrap. If you are already familiar with The Garden Slug menu, you will know they have vegetarian and vegan choices. For our DWC, they will be designing a special menu for us. Thank you Sluggies! The first DWC is on 29th March 2015, Sunday, from 6:30pm to 8pm. The silent auction will start on 1st March, and the link to the online auction form will be blasted on our social media platforms. So follow us on Twitter/Instagram/Facebook (links below) to keep a lookout for the link! Bidding will close on 12th March 2015 before midnight. Secretly, although this will help in fundraising, we like that it also raises awareness of the strays in Singapore that we care for, in a happy, cosy setting. We want you to enjoy being cat-evangelised to! Spread the word so that we can have a successful first DWC this March!